Dinant Oosterbaan received a J.D. law degree from Erasmus University in Rotterdam, the Netherlands, where he graduated in 1969. He went on to study for a Masters degree at New York University School of Law. 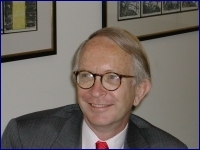 He joined the IBM legal department in 1971 and worked with IBM in a variety of legal positions in the Netherlands, Paris and the United States. He was admitted to the Dutch bar in 1981. Dinant Oosterbaan is considered to be one of the pioneers in IT Law and now has over 35 years of experience as a lawyer in the information technology industries, handling matters such as computer and software contracts, software licensing, software and data base protection, domain names, distribution and licensing agreements, joint venture agreements, competition law, litigation and dispute resolution, data protection, EDI, telecommunications regulation and various other aspects with respect to Information Technology. As a result Dinant Oosterbaan has a thorough understanding of IT Law and is considered a 'revered statesman of the Dutch IT Law scene' and a 'highly-respected IT guru'. Dinant Oosterbaan is listed as an arbitrator with WIPO, the Netherlands Arbitration Institute and the Czech Arbitration Court (domain names). Dinant Oosterbaan also has substantial experience in the fields of Corporate and Commercial Law, including mergers and acquisitions, joint ventures and Labour Law. He speaks Dutch, English, French and German fluently. Dinant Oosterbaan has participated as chairman and speaker at over 100 national and international conferences, graduate and post-graduate level university courses on computer and telecommunications law in the Netherlands and other countries around the world, such as the USA, Brazil, Japan, Germany, England, Sweden, France and Spain. See Publications for the full articles and other recent publications of Dinant Oosterbaan.